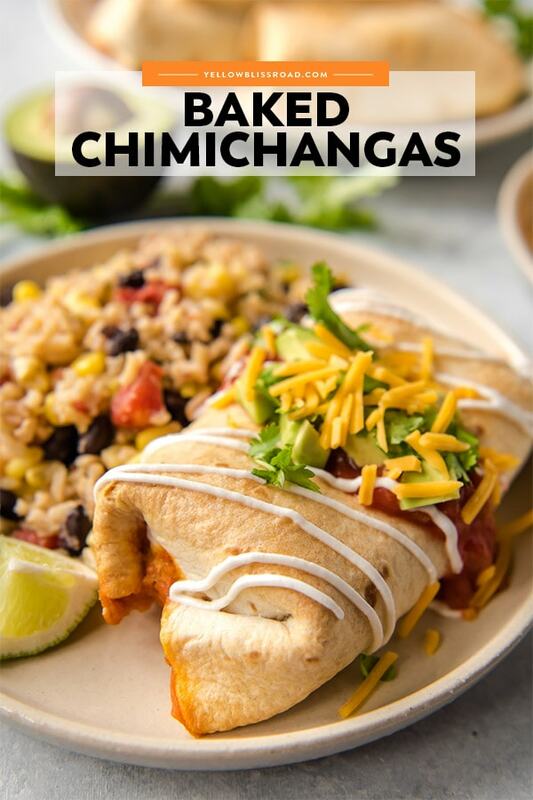 My Easy Baked Chimichangas are quick and simple and require no frying to get that crispy outer shell. Stuffed full of chicken, beans and cheese, these chimis are the start to a perfect Mexican dinner. 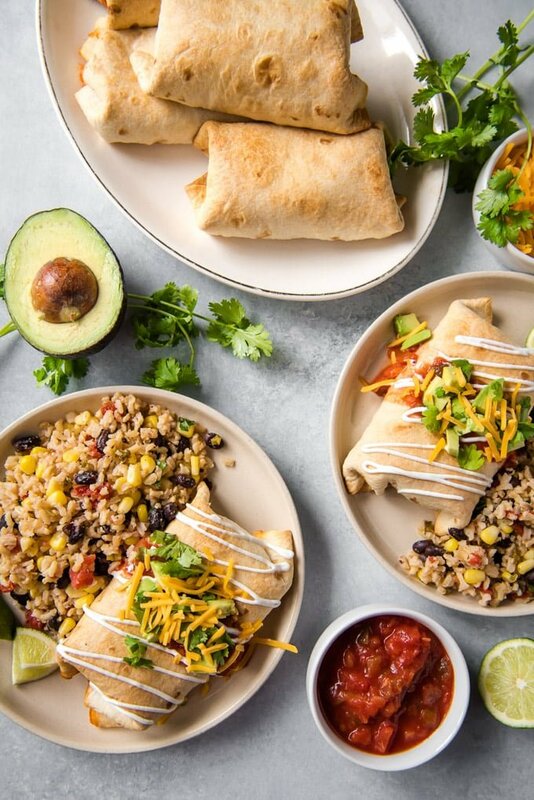 Chimichangas are a favorite meal at our house. We love to top them with Guacamole, Black Bean and Corn Salsa, sour cream and cheese. 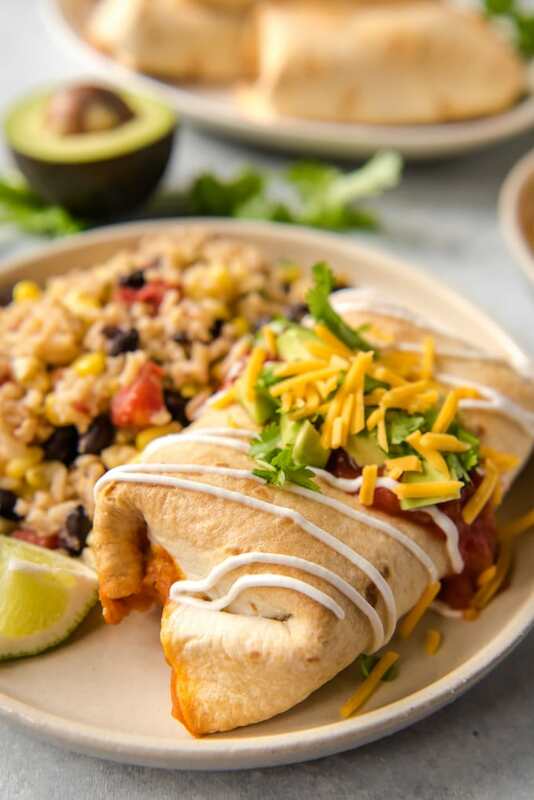 Chimichangas are one of our favorite indulgent Mexican dishes. 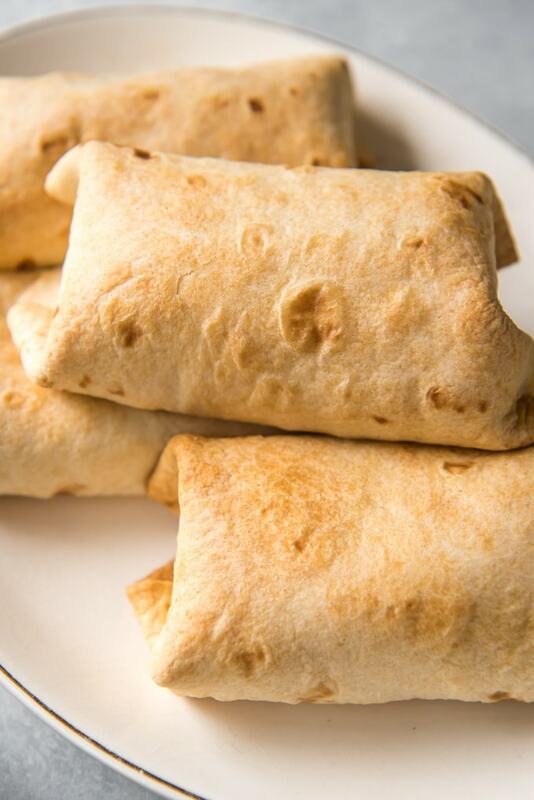 They are stuffed with delicious fillings and baked until golden and crisp. They can also be deep-fried but baking them is healthier and much less messy. A burrito is a rolled tortilla stuffed with a filling of shredded meats, cheese or beans. 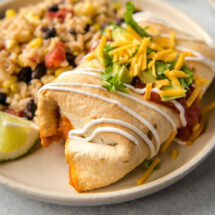 A chimichanga is simply a baked or fried burrito. Preheat your oven and line a baking sheet with foil or a silicone mat. 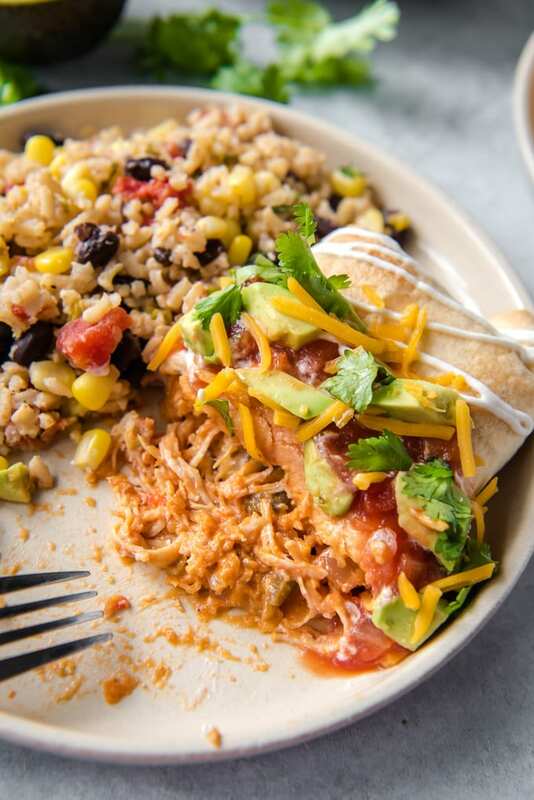 Combine shredded chicken in a large bowl with your favorite salsa, refried beans and cheese. Spoon some of the mixture onto the center of a large flour tortilla (8-10 inches). Wrap the tortilla around the filling, folding in two opposite sides, then rolling from the other side. Place the chimichangas seam side down on the baking sheet and brush the tops with melted butter. You could also spray them with nonstick cooking spray. Bake chimis for 25-30 minutes or until golden brown and crispy on top. Chimis are so versatile! They can be filled with just about anything you can think of, and served with a variety of sides. Make them large or small depending on whether you’re making a meal or an appetizer. Serve them with toppings like salsa, guacamole, sour cream, cheese and cilantro. Make a meal with Mexican rice and beans or Mexican Street Corn Salad. If you have leftovers, store them in a large ziploc bag or airtight container for up to 4 days in the refrigerator. Reheat individual chimis in the microwave for 30 seconds to a minute. You could also heat several on a baking sheet in the oven. If you’d rather fry your chimis instead of baking them, you can fill a deep skillet with about two inches of oil. Once it’s hot, add the chimichangas one at a time seam side down. Turn them every minute or so for even browning. Transfer to a paper towel lined plate to drain, then serve hot. 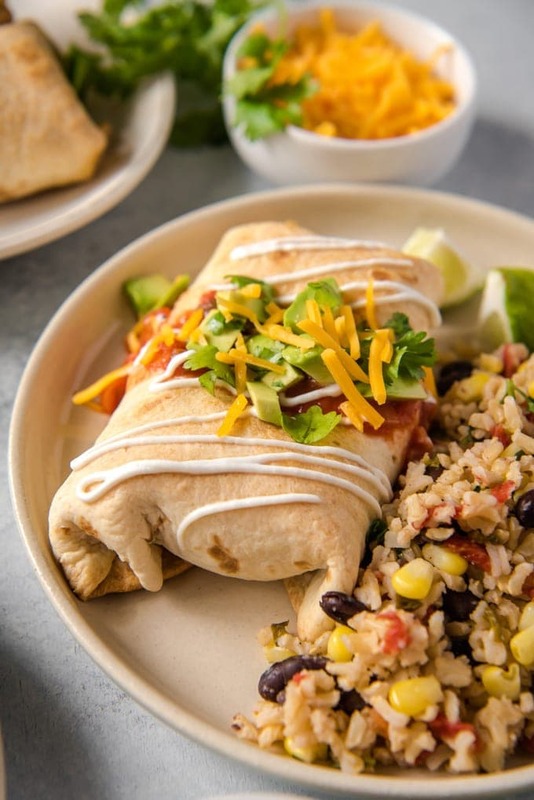 These baked chimichangas make a perfect freezer meal, and they don’t even need to be baked first! Just fill the tortillas and roll them up, then wrap then individually in foil or plastic wrap. To bake, thaw them in the fridge overnight, then unwrap and place on a baking sheet. Bake according to the recipe directions below. Preheat oven to 400°F. Line a large baking sheet with foil or a silicone baking mat. Mix chicken, salsa, beans, cumin and cheese. Place about 1/3 cup of the chicken mixture in the center of each tortilla. Fold opposite sides over the filling, then roll up from bottom and place seam-side down on the prepared baking sheet. Brush the tops of each chimichanga with melted butter. Bake at 400°F for 25 minutes or until golden and crispy. Garnish with desired toppings and serve with sour cream, guacamole and salsa on the side. 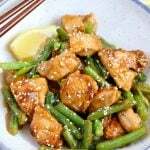 Feel free to replace the chicken with shredded pork or beef, and fill with your choice of beans, cheese, etc. Just made this for dinner tonight…Fabulous!! So good! !